Welcome to another exciting sneak peek into The Catholic Hipster Handbook from Ave Maria Press. Today we're going to take a look at a piece from Mary Rezac on the definitive Catholic Hipster footwear. "...if I could pinpoint a particular kind of footwear that truly unites us Hipster Catholics, it’s the sandal. And the type of sandal selected by the wearer breaks us up into further subcultures. Are you wearing Chacos or Tevas? Then you might work at Camp Wojtyla, Catholic Youth Expeditions, or some similar Catholic summer camp. Are you more of a Birkenstock kind of Catholic? Perhaps you’re a seminarian, a priest, or an aspiring discalced Carmelite." Have you ever been to a Mass where a priest is wearing sandals? I have. And in those instances, I feel instantly transported into the time of Christ, to the Last Supper. Call me crazy, but it's true. "As for me and my house, we always tended to favor the Birkenstocks (which we a ectionately referred to as Birks. Or, if paired with socks, then ‘stocks ‘n’ socks). And when I say my house, I’m talking about my college household, Avila, named after St. Teresa of Avila. The household in and of itself was an extremely hipster thing to be a part of, since I did not go to a Catholic or otherwise religious university." After reading that, I think I need to text my dad and tell him his "Jesus Sandals" from back in the 80s were actually quite hip! "So the next time you’re in a big group of Catholics, look down. Chances are you can spot the Hipster Catholics by their sandals." What do you think is the quintessential Catholic Hipster footwear? 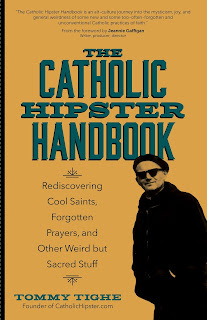 And...while you're thinking about it...go and pre-order The Catholic Hipster Handbook to finish up Mary's section on sandals and all the other amazing topics covered by an amazing list of hip contributors!